READER’S EDITORIAL: JULIAN-CUYAMACA FIRE--TO BE OR NOT TO BE? June 21, 2017 (Julian) -- Julian-Cuyamaca Fire Protection District is at risk. Choices appear to be (1) Do nothing and persevere until finances force it to dissolve; (2) Voluntarily dissolve and allow the Fire Authority to take over; (3) Increase the Benefit Fee to cover the rising costs and remain viable as an independent/volunteer fire department. Read more about READER’S EDITORIAL: JULIAN-CUYAMACA FIRE--TO BE OR NOT TO BE? June 19, 2017 (San Diego) – Cal Fire Captain Isaac Sanchez has asked media to remind the public about several new laws passed by California’s Legislature last summer to address problems raised by drones that interfered with firefighting, including causing delays by firefighting aircraft. Under the new laws, anyone whose drone interferes with emergency personnel can be charged with a misdemeanor and if their drone is damaged or destroyed in the process, they will not have legal recourse to hold emergency responders liable. Photo, left: Michael Johnson volunteered to lead cleanup efforts to keep shooting range open on public land. June 16, 2017 (Jamul) -- A fire alarm going off at the Oak Grove Middle School, where the Jamul Dulzura Community Planning Group held its June 13th meeting, provided a jarring start to the session at which fire danger was top of mind for many present. June 10, 2017 (Jamul-Dulzura) -- The Jamul-Dulzura Community Planning Group's meeting on Tuesday night will include a discussion of concerns raised by the Gate Fire, including shooting on Bureau of Land Management property. Also on the agenda are a Jamul Indian Village update and the County's strategic plan to reduce waste in unincorporated areas. June 9, 2017 (El Cajon) - Cal Fire crews are at the scene of a 10-acre brush fire south of I-8 at Los Coches. Lanes are re-opened and the forward spread has been stopped, but be advised. No structures are threatened or injuries to residents are reported, according to Cal Fire. The fire is 10% contained. June 4, 2017 (Ramona) -- State Route 78 will be closed for 10 days between Weekend Villa Road to Indian Oak Road between Escondido and Ramona, starting on Friday, June 9th at 6 a.m. through Monday, June19th. May 28, 2017 (San Diego’s East County) – Aiming to prevent more wildfires, the federal Bureau of Land Management yesterday announced a ban on target shooting, campfires and other high-fire risk activities by issuing State III fire restrictions for all BLM-managed public lands in San Diego County and other Southern California areas. After a wet winter, warming temperatures are quickly drying out the abundant annual grass crop. The increasing fire danger posed by the high volume of dead grass and hotter, drier conditions in the region is prompting CAL FIRE to suspend all burn permits for outdoor residential burning within the State Responsibility Area of San Diego County This suspension takes effect May 26, 2017 and bans all residential outdoor burning of landscape debris such as branches and leaves. May 24, 2017 (Dulzura) – Back on in early April, Supervisor Dianne Jacob wrote to three officials at the U.S. Bureau of Land Management urging them to close down public shooting in and around Donohoe mountain in Dulzura. Her requests were ignored, and last weekend, the Gate Fire that starting by a shooting range in the area charred over 2,000 acres, caused evacuations of residents and an exhaustive response by fire officials and first responders to keep the public safe. Now, Jacob has fired off a new letter – this one to Ryan Zinke, the new Secretary of the Interior, which oversees the BLM. Photo: The San Diego region is more prepared for wildfires this year than it has ever been and residents need to do their part to lessen their risk and be ready to evacuate if it is recommended. May 23, 2017 (San Diego) - This past weekend’s Gate Fire should have ended any lingering thoughts that the year’s ample rains dampened San Diego’s wildfire threat and the need to maintain defensible space around your home. May 23, 2017 (San Diego’s East County) – A brush fire yesterday afternoon scorched approximately 13 acres in Mission Trails Regional Park. The blaze began at Big Rock and was burning toward Cowles Mountain, Jay Wilson with Mission Trails Regional Park’s Foundation told ECM. As a result of the wildland fire, three trail heads are temporarily closed: The trail heads at Big Rock Park, Big Rock Road and Shantaung Drive are temporarily closed. The trail heads from Mesa Road, Lake Murray Blvd. and Barker Way are open. Photos by Cynthia Wharton, taken yesterday from Otay Lakes Road just before it was shut down. May 21, 2017 – A criminal arson investigation has been launched into the cause of the Gate Fire, which has charred 2,056 acres and is now 70% contained. Captain Isaac Sanchez with Cal Fire told ECM news partner 10 News that a video shot by a target shooter and posted on social media shows a group of people starting the fire. The video may be this one posted by a user named Vandalsworld on Instagram: https://www.instagram.com/p/BUVtlvSBN0r/?hl=en. The poster claims the people started the fire, but it is unclear whether the fire was started by shooting or some other way. After the fire started, the people could be seen walking away from the scene. Earlier, some neighbors had blamed the fire on shooters at a target range near where the fire began, in an area where shooting is believed to have started several prior brush fires. But now a shooter may have captured evidence to catch possible arsonists or careless individuals whose actions ignited the Gate Fire. Firefighters continue to make progress towards full containment, Cal Fire reports. State Route 94 has been reopened, as well as Otay Lakes Road. Please drive with caution, however, in this area. Update May 21, 2017, 8 a.m. -- The Gate fire nearly doubled overnight to 1,500 acres, but firefighters made good progress overnight and the wildfire is now 30% contained. Road closures remain in effect. Update 9 p.m. - An overnight shelter is opened at Otay Ranch High School, 250 Olympic Parkway in Chula Vista for those who have evacuated. Pet supplies and RV parking are available. May 20, 2017 (Dulzura) -- The fast-moving Gate Fire has charred 800 acres and is 10% contained. Tonight at 6:30 p.m., the following emergency message was sent to 77 contacts by the San Diego County Sheriff's Department: “There is a fire in the area of Dulzura. The wind is blowing to the East and there is a concern that the fire may spread to your area. You are being advised to be ready to evacuate if notified to do so. You may evacuate now if you choose to do so. The evacuation route is Highway 94 East to Buckman Springs North to Interstate 8 West. Take interstate 8 West to East Willows Road. Exit East Willows Road and turn right(north). Continue West on East Willows Road to the Viejas Casino. The Red Cross will have a temporary evacuation center located in the casino parking lot. This a fire warning only, not an evacuation order"
If you have an emergency call 9-1-1. Monitor local television and radio stations, or call the San Diego County Information line by calling 2-1-1 for updated information. For animal emergencies related to this fire please contact Animal Services Dispatch (619) 767-2675. Upate 1:20 p.m. : Brush fire is now 300 acres. Pio Pico campground has been shut down. There is a hard closure of highway 94 from the Dulzura Cafe to State Route 188, per CHP site. Take alternate routes and avoid this area. May 20, 2017 (Jamul/Otay) -- A brush fire that started on Otay Lakes Mountain south of Jamul has burned 100 acres, per Cal Fire, and is spreading at a dangerous rate of speed in the vicinity of State Route 94 and Otay Lakes Road. 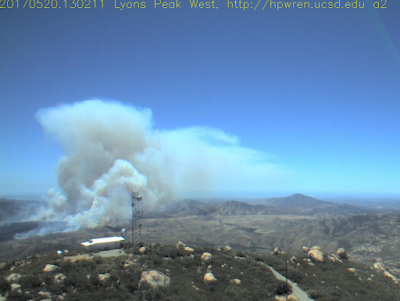 California Highway Patrol has ordered Otay Lakes Road shut down due to the fast-moving fire. May 19, 2017 (San Diego’s East County) – What’s it like to be a firefighter? Find out on June 17th from 8 a.m. to 4 p.m. at the Heartland Fire Training Facility, 1301 North Marshall Avenue in El Cajon. “Fire Ops 101,“ a fire ground-operations orientation for civilians including elected officials and media representatives, will include actually suiting up in firefighter protective clothing, donning self-contained breathing apparatus and actually going inside a real fire to experience firsthand the environment in which firefighters work. NEED HELP TO CLEAR DEFENSIBLE SPACE? Read more about NEED HELP TO CLEAR DEFENSIBLE SPACE? May 10, 2017 (Jamul) - CAL FIRE and San Diego County Fire, in cooperation with California Department of Fish & Wildlife, will be conducting a habitat restoration prescribed burn approximately 4 miles southeast of Jamul within the Rancho Jamul Ecological Reserve. Burning of standing vegetation will occur on approximately 70 acres as part of CALFIRE’s Vegetation Management Program (VMP). Ignition will occur at approximately 8:00 AM on May 11, 2017 and smoke may be visible throughout the County. May 1, 2017 (Jamul) – When SDG&E received approval to build the Sunrise Powerlink high voltage lines across rural East County, the company was required to provide fire mitigation grant of up to $2,000 for impacted homeowners to create defensible space through landscaping and/or install fire-hardening building materials to protect their properties. CHIEF’S CORNER: WILDFIRE SAFETY—THERE’S GOLD IN THEM THAR HILLS…AND IT’S DANGEROUS! May 1, 2017 (San Diego) -- There’s Gold in Them Thar Hills! It’s also along the freeways, in open fields and vacant lots in your neighborhood. That lush green vegetation and pretty wildflowers from recent winter storms is now turning golden in color and soon to become dark brown, brittle and extremely dry. Fire season is already here and getting extremely dangerous quickly. We’ve already seen quite a few fast moving grass/brush fires throughout Southern California. Read more about CHIEF’S CORNER: WILDFIRE SAFETY—THERE’S GOLD IN THEM THAR HILLS…AND IT’S DANGEROUS! April 26, 2017 (Rancho San Diego) - More than a hundred emergency response volunteers from throughout San Diego County assisted “victims” of a simulated explosion during a test of their skills at Cuyamaca College over the weekend. April 21, 2017 (San Diego) -- Being ready for wildfires has never been easier than with CAL FIRE’s new Ready for Wildfire app. This new tool puts a whole library of step-by-step checklists in the palm of the user’s hand. April 21, 2017 (Santee) — San Diego County Fire Chiefs, along with fire agencies across the region, held their annual wildland fire preparedness exercises April 19-21 in Santee and Tierrasanta to prepare for the upcoming fire season. April 21, 2017 (El Cajon) -- As natural disasters continue to grow and become more destructive, emergency responders, such as CAL FIRE San Diego, are becoming increasingly dependent on community volunteer organizations. One such organization that has been called on to assist is San Diego County’s Community Emergency Response Team (CERT). When activated through their sponsoring agency, CERT members can find themselves working in close cooperation with local first responders; augmenting their numbers and aiding their neighbors that have been affected by a disaster. Skills that CERT members have been trained in can include basic first-aid, volunteer organization and search and rescue. CERT members were activated as recently as last year during the Border Fire in Potrero and quickly became an integral part of the community response by helping families and property owners that were impacted by the fire which ultimately grew to nearly 7700 acres over two weeks. April 20, 2017 (Descanso) – Do you have a plan for reducing your wildfire risks and protecting your family and pets? The Descanso Emergency Planning/FireSafe Group is holding a workshop on Saturday May 6 from 1-3 p.m. at the Descanso Library (9545 River Drive in Descanso) to help families prepare for wildfires. April 20, 2017 (San Diego’s East County) -- If a disastrous event overwhelms or delays the community’s professional response, CERT members can assist others by applying the basic response and organizational skills that they learn during training. These skills can help save and sustain lives following a disaster until professional help arrives. April 17, 2017 (San Diego’s East County) -- Are you prepared for a disaster? An earthquake or firestorm? Consider attending a Community Emergency Response Team (CERT) academy. Free disaster training will be taught by members of Heartland Fire & Rescue and Santee Fire Department in classes that begin May 6th. April 16, 2017 (Ramona) -- As the temperatures continue to rise region-wide, CAL FIRE San Diego is beefing up preparations for fire season by opening the Ramona Air Attack Base in Ramona. April 13, 2017 (Spring Valley) -- The San Miguel Fire District continues to take the necessary steps to go back to being a stand-alone agency and cut the cord from Cal Fire, which currently provides its fire protection services.